Go on a shopping spree for the entire family with Old Navy Canada. Shop online today and save 30% off your entire purchase or 40% off your purchase of $100+ by using the promo code MORE at checkout. This promo ends on March 3, 2019. Also, all kids and baby items are on sale! 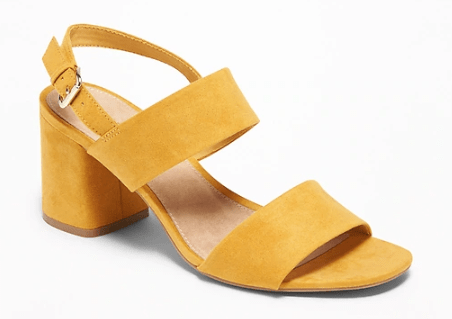 This Faux-Suede Slingback Block-Heel Sandals are on sale for only $27.96 (originally $39.94) when you use the code MORE at checkout to receive 30% off. You save $11.98. Smooth faux-suede double-strap upper, with buckled slingback ankle strap. Cushioned faux-suede foot bed. Features a 3″ faux-suede wrapped block heel. Flocked thermoplastic rubber outsole. Water & stain-repellent fabric. Take that, rain and dirt.